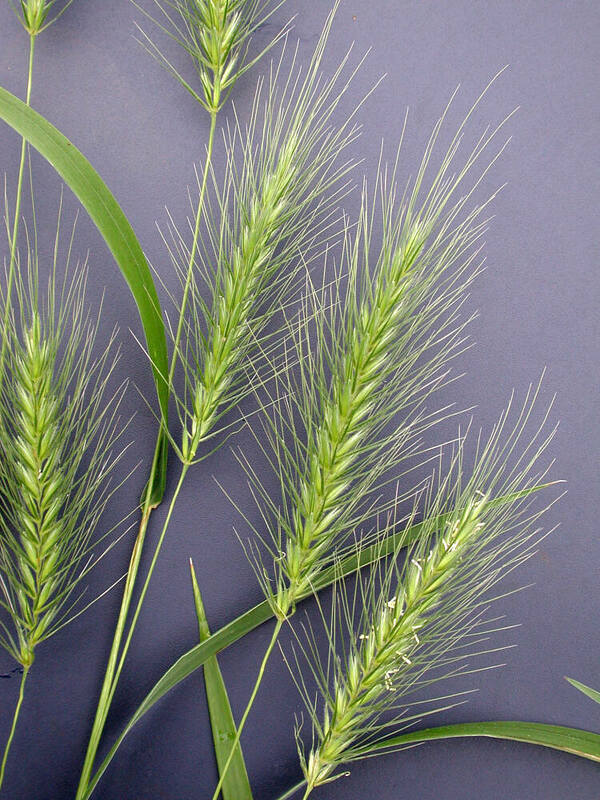 Elymus villosus.Courtesy W. John Hayden.Richmond University.facultystaff.richmond.edu (Accessed 5/2014). Elymus villosus is a perennial C3 grass (Basinger 2002), tufted, 30 cm to 1 m tall; sheath open but tight, ligule membranous, short. Leaves alternate, 5-7, softly hairy above, 0.5-1 cm wide, base with small lobes. Flower spikelets 1-flowered but in pairs, glumes bristle-like 1.5-3 cm long, to 0.1 cm wide, not widened above, lemma 2-4 cm including awn, palea about 0.6 cm long, blunt tipped, cupped in lemma; inflorescence spike single, 5-12 cm long, appearance fox-tail-like, densely flowered, axis usually hairy; blooming June-Aug.
Habitat: Dry woods and edges. Notes: Often infected with an endophytic fungi Epichloë elymi (Clavicipitaceae, Ascomycota), (Clay and Leuchtmann 1989; Schardl and Leuchtmann 1999).